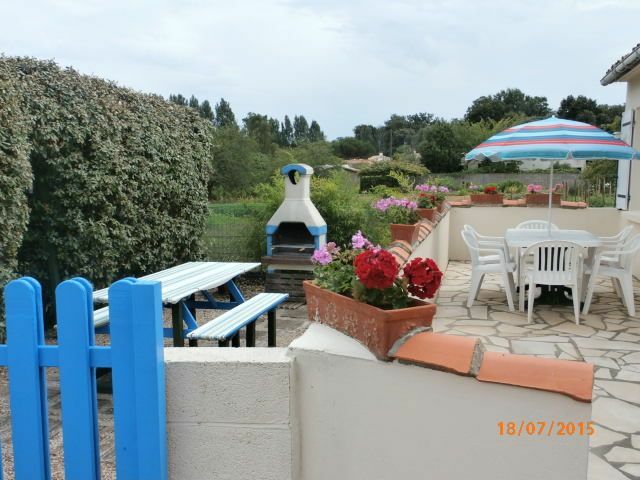 The house is directly opposite pine forest and superb unspoilt beaches in the Vendee, France. The apartment consists of kitchen/diner, 2 bedrooms (double and twin), lounge/3rd bedroom with satellite TV, DVD player, games , books and double bed with patio doors onto the garden and a bathroom with shower. There is a patio with table and 6 chairs and a BBQ garden with a garden table, please see our photos. We bought this property for its location. It is in the South Vendee opposite a pine forest, which leads to our nearest beach. The area is laid back and with all facilities nearby. The South Vendee is a beautiful area with natural unspoilt beaches with many areas of interest and activities. There are many activities including Atlantic Wake Park (L'Aiguillon-Sur-Mer), Surfing, Canoeing, Kayak, Indian Forest and Water Park, Puy du Fou (Winner of the biannual Applause Award at IAAPA 2014, this is considered to be the 'Academy Award' of the amusement park industry, the Applause Award is given out every two years), Zoo, Aquariums, Floral Park, Chateaus and many more activities to suit everyone. We are close to beautiful La Rochelle (about 40 miles) with its old port, La Roche-sur-Yon (20 miles), Les Sables D'Olonne (18 miles) where the Vendee Globe yacht race departs from every 4 years in November (next departure is 6th November 2016) and Talmont-Saint-Hilaire (10 miles) which has a castle of King Richard 1 (Richard the Lionheart). Available at the main house, if requried. All the beds are fully made up on arrival. If your stay is for 2 or more weeks a complete set of freshly washed and ironed sheets are supplied at the end of each week. A washing service is available at €7 per load. Your washing is returned washed, dryed and folded. 2 hand towels and bath mats in the bathroom and a towel and tea towel in the kitchen. If your stay is for 2 or more weeks a complete set of freshly washed and ironed towels are supplied weekly. This is incorporated with the 3rd bedroom. Consists of a double bed, chest of drawers, clothes hanging area, 3 piece suite, coffee table, English TV (Freesat), DVD player, books and games. There is a fridge/freezer in the bungalow. Welcome pack of tea, coffee, sugar, milk, water, juice, wine, beer and charcoal for your first BBQ. The bungalow is fully equipped with all plates, dishes, cups, glasses, cutlery and utensils. We have a table and 2 benches in the BBQ garden, a patio table and 6 chairs on the patio and a kitchen table in the kitchen that seats 6 for dining so plenty of choices. Fully self contained accomodation including a 4 hob gas cooker,microwave,toaster & fridge freezer.The patio has a table,6 chairs,bench with 2 sun loungers.The BBQ garden has a static concrete BBQ with charcoal provided & a picnic bench. All bed linen (English pillows) & hand towels are provided,please bring your bath and beach towels as required.A small but appreciated welcome pack of a bottle of winte, lager, tea,coffee,milk,drinking water & sugar is also provided on your arrival. Included in the lounge/3rd bedroom is a double bed,chest of drawers,clothes hanger with shelves.Also a very comfortable 3 piece suite comprising 3 seater settee & 2 arm chairs, the settee folds out into a sofa bed if required.UK satellite television (BBC & other UK terrestrial TV plus Sky news & channels included within the Free view range,UK radio channels as per Sky service) & a DVD player. Also family holiday facilities are close by including a bar, games room, shop and restaurant. We were a family of 5 (2adults, 3 kids) staying in this well equipped property. We enjoyed a lovely week. The hosts were very friendly and helpful. Would definitely stay again! What a fantastic break, a lovely apartment tucked away from all the hustle and bustle and yet close enough (on average 5-10 mins by car) to some gorgeous sandy beaches ranging from the gentle (great for the little ones) to the extreme (great for the not so little ones) in terms of waves / surf. The accommodation is well laid out with everything you need and is comfortable and spacious. The hosts (Paul & Lou) are close by and generous with their time and hospitality. All in all - a great family holiday which I would be happy to repeat again next year! A lovely week in a spacious, comfortable and well equiped apartment. (is bigger than it looks in the pictures) Paul and Louise were helpful and welcoming and we really appreciated the wine and beer left for our arrival. The BBQ and outdoor seating area were a real bonus and were used at every opportunity when the sun was out. The beach is a short walk away and is great for surfing and relaxing. Would recommend hiring a car so you can get out and about to restaurants and other towns like La Tranche or La Rochelle. A great time was had by all. A great place for a relaxing holiday. Close to great beaches, lovely forest walks and accommodation could not be better value for money. Thanks to Paul, Louise, Oliver and Brook! for all the kind help and great advice on the area, you are great hosts. The property was exceptionally clean and well maintained, and we would thoroughly recommend it. We hope to return at some point in the future. With a great location near the sea (but not too touristy), the private apartment is tucked behind Paul and Louise's house and has a rural prospective. Paul and Louise are very friendly and always on hand to help, give advice or just have a chat. The apartment was clean, well equipped, spacious, comfortable and good value for money. We also enjoyed the 'garden rooms' - large patio, gravelled yard and BBQ area. A car is needed to explore the miles of beautiful beaches and other sights, and the forest opposite offers endless walking and cycling. Thank you Paul and Louise for making us feel so welcome, together with Oliver and Brook (the dog). Our grandchildren had fun at the chateau at Talmont St Hilaire with the medieval games etc and the Puy du Fou is a MUST! Laid back rural coastal area, pretty friendly ports and spectacular natural beaches with activities for all tastes and a place to escape to for relaxation, for a stress free holiday if desired. Excellent local cuisine to suit all tastes. There are many activities including Atlantic Wake Park new in 2015(L'Aiguillon-Sur-Mer), Surfing, Canoeing, Kayak, Indian Forest and New Water Park, Puy du Fou (Winner of the biannual Applause Award at IAAPA 2014, this is considered to be the 'Academy Award' of the amusement park industry, the Applause Award is given out every two years), Zoo, Aquariums, Floral Park, Chateaus and many more activities to suit everyone. We are close to beautiful La Rochelle (about 40 miles) with its old port, La Roche-sur-Yon (20 miles), Les Sables D'Olonne (18 miles) where the Vendee Globe yacht race departs from every 4 years in November (next departure is 6th November 2016) and Talmont-Saint-Hilaire (10 miles) which has a castle of King Richard 1 (Richard the Lionheart). WE DO NOT ASK FOR A SECURITY/BREAKAGE DEPOSIT INCLUDED IN YOUR BOOKING FEE, BUT DO ASK FOR A £100/€100 DEPOSIT ON ARRIVAL, THIS IS RETURNED AT THE END OF YOUR STAY AS LONG AS THERE ARE NO BREAKAGES AND THE APARTMENT IS LEFT AS YOU FOUND IT, THANK YOU. PLEASE NOTE THAT WE ACCEPT PAYMENT THROUGH ONLINE BANKING OR STERLING CHEQUE - THANK YOU On your arrival the apartment is cleaned, complete with welcome pack with all the beds freshly made up for you at no extra charge. If your stay is for 2 weeks you have a freshly washed and ironed complete set of bedding, kitchen towel and tea towel, 2 hand towels and bath / toilet mats for the bathroom at no extra charge. If you require any washing throughout your stay a service is provided at €7 a load which includes the items being delivered back dry and folded.